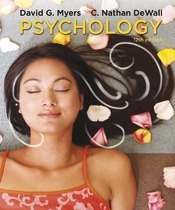 With every carefully revised, meticulously updated edition, Psychology by David Myers and Nathan DeWall continues to be the best-selling introductory psychology text/media resource. And students don't just use it—they love it. How do we know? They tell us. Students contact the authors regularly to give them feedback and to thank them. This engagement in the text - - and positive feedback from students- - extends to the integrated media resources in LaunchPad. The innovations around the text and media rest on the same foundations that have always distinguished each Myers/DeWall revision- - exhaustive updating, captivating writing, and the merging of rigorous science with a broad human perspective that engages both the mind and the heart.